Getting around Mississauga without a car can be a huge hassle. We’re happy to say that for Mississauga drivers, getting a car loan isn’t. Our network of Mississauga dealers specializes in bad credit auto financing. Apply, get approved, choose your car. It’s that simple. Access to the most competitive rates in Mississauga. Can I get a car loan at LowestRates.ca if I’ve filed for bankruptcy in the past? Yes. We specialize in car loans for Canadians with bad credit. So even if a past bankruptcy severely damaged your credit score, we can match you with a Mississauga dealer and help you get a car loan. Of course. Our application process is simple and we’re happy to work with all Mississauga drivers, regardless of their level of experience on the road. As long as you meet the minimum car loan requirements, we can help you finance your first car. I just moved to Mississauga from another country. Can I still get a car loan? Yes. We’re happy to work with drivers from other countries who haven’t had a chance to establish a Canadian credit history. What do I need to qualify for a car loan in Mississauga? How much tax do I have to pay on a vehicle purchased in Mississauga? You’ll have to pay 13% in HST. Don’t forget to include this amount in your car-buying budget. Long car loans chop your principal balance into small monthly payments and spread them out over an extended period of time. Short car loans do the exact opposite. Your principal balance (plus interest) is divided into large payments and you pay off the loan quicker. 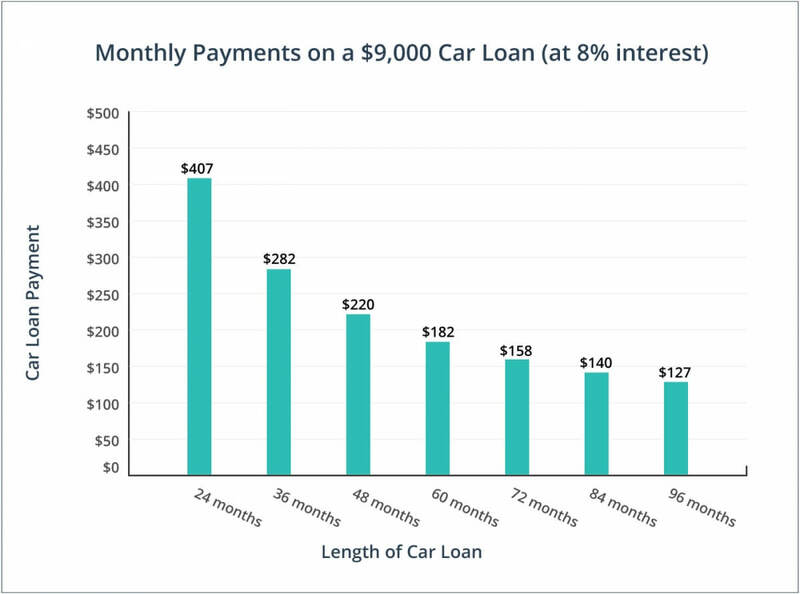 But don’t forget: getting a longer car loan means you’ll pay more in interest. You can’t shop for your new ride until you know your budget, so spend time negotiating the details of your car loan: what loan amount are you approved for, what interest rate can you get, and what are your payment options? The price tag on the car is just one of the car ownership expenses you have to consider. There’s also insurance, repairs, maintenance, and fuel economy. Research the total costs of operating a vehicle before you buy. Registered dealerships have to follow strict rules and regulations, so you’ll gain certain rights and protections if you buy from one of them instead of from a private seller. If you can afford bigger monthly payments right away, opt for a shorter loan, like a 24 or 36-month loan. You’ll pay less interest and get rid of your loan in less time. I can’t get a car loan if I have bad credit. False. If you have bad credit or no credit, our car loan service in Mississauga is actually perfect for you. I can use my car loan to buy a vehicle at any dealership in Mississauga. False. Our car loan service matches you with a dealership in your area and that same dealership provides your financing. You can only use the loan to purchase a car from their lot. I’m only protected under the Motor Vehicle Dealers Act if I buy a new car. False. If you buy a car, new or used, from a registered Mississauga dealership, you’re entitled to the protections provided under the Motor Vehicles Dealers Act. Mississauga dealerships have a ‘cooling off’ period for used car sales. False. There’s no cooling off period for used car sales in Mississauga or anywhere else in Ontario. Registered car dealerships don’t have return policies and aren’t obligated to give you a refund if you’re not satisfied with the vehicle. The Ontario Motor Vehicle Industry Council takes its code of ethics very seriously. OMVIC recently fined a Mississauga dealer $7,000 for selling several vehicles without disclosing previous accident damage. Mississauga drivers pay some of the highest auto insurance rates in Ontario, with millennials paying over $300 per month on average. Want to know how much the car you’re interested in is worth? Check out the Canadian Black Book, an excellent resource for researching the value of used cars. Mississauga drivers have some of the longest commute times in Canada, at over 30 minutes on average.